A new badge courtesy from a teachy friend, Dhems. Thanks sis. The kids went to sleep early last night because their Dad attended his first summer class until 10 pm. when he came home they were already asleep so we had an ample time to browse photo albums. 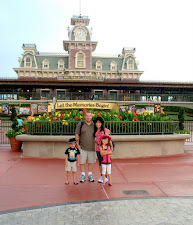 It's nice to look back and reminisce those past years and see the different milestones of our children. The picture below was taken in June 2007. We bought a weeping cherry tree online and planted it in front of our house. We called this Rylie's tree because she helped us in planting it. We thought that the tree isn't going to live because when it arrived in the mail, it was just a twig. You may click the photo for a large view. But it did, when we came back from Korea, it is taller than Rylie already. Thanks again for the participants who travel with me down memory lane. I can still remember how excited and happy she was while digging the dirt while saying "my tree, my tree". Good choice hon! I kinda miss when she still that age. Time flies so fast and I am gad we took lots of photos of their growth. joops is right. time flies so fast so sooner or later rylie's tree will bear fruits. this meme is fun tokaya. will join from now on. nga pala di pa kita nabati...congratulations! congratulations sa new meme mo ang ibig kong sabihin, tokaya. And yes, it's always great to look back at old photos. Thanks for inviting me to join your meme. I'm sure she enjoyed helping to plant the tree. nice memory flash back ..She has something to share when she become a teenager! wag muna asawa kasi parang iiyak si Mommy Rose niyan kaya teenage muna hehehe..
Join you this time sis and thanks for inviting me.. I got my first entry now. oh, what a cute tree planter Rylie..ksing cute ng tree nya pero ayan at mas matangkad na ang tree niya sa kanya...it is indeed great to keep and reminisce children's old photos..hindi mo nlang mlalaman sis, may dalaga ka na pala.. The tree ages with Rylie, how cool! 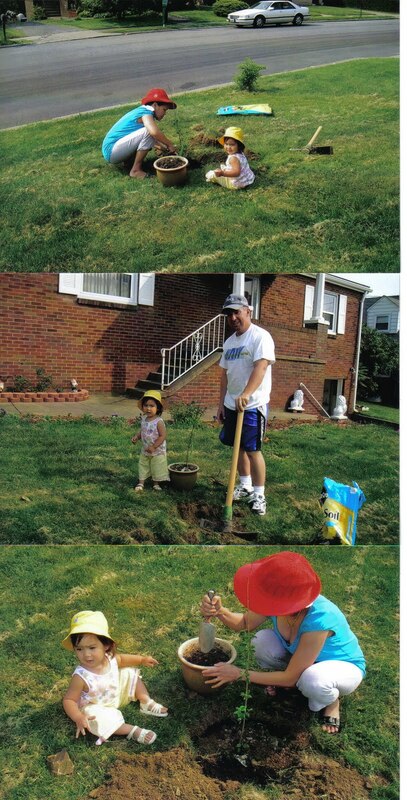 She will always say, that she helped plant the tree. Buti na lang ang dami nyong pix ng mga kids nyo--agree with Sir Joops,mabilis ang paglaki ng mga bata!Ang mga anak ko,palaki na rin ng palaki!! look at that sis, ang galing mo talaga!! congrats for this, that you captured it when you still planting a tree with rylie.. how nice. Great job sis!!! btw, mine is up.. hihi.. bloghop ako later to catch up your update..
awwwwwwwwwww....nostalgic talaga tong entry mo badingding...ang liit pa ni rye dito ano....and look at her now....waaaaa...pretty soon may bunga na yan...ehehehe! bukas na sa akin...gotta hit the hay...mwah! I love cherry trees. It is nice that you planted a Rylie tree, I bet it will be a tree full of memories. wow, how long ba mamunga ang cherry tree Rose. Wow, akalain mu kasing laki na sila ... great job mommy Rose documenting... naku! wala kaming ganyan kalawak na lawn ... ahihihi... sa paso nalang siguro ... heheheh..
Di na talaga ako nakalimot magcomment... LOL! wow how nostalgic talaga mommy rose! you had captured it well. that's a nice thing, nagtanim kau ng tree, kasabay ni rylie paglaki, dito sa amin ang daming trees, wahhhh! Awww, I love weeping cherry trees! So many people in our neighborhood has them in their lawn. I love the umbrella look and the pink flowers it will have when it bloom. Good choice of tree you got, Rose. That's good that your little girl helped so she will remember that when she'll grow up as a lady. woi, your my darling angel talaga...ahahahha...thanks sa opps ha....you are the best badingding...matagal ko nang inaabangan ang opp na yon...dko maabutan...salamat ulit...will, email you the codes....mwah! Mabuti at nabuhay yung cherry tree ni Rylie maski naiwan ninyo ito nung pumunta kayo sa Korea. Malamang ay inalagaan din ito nang iyong mga inlaws lalo na yung FIL mo. Nakakatuwang makita ang mga nostalgic photos nyong lahat. Sayang nga lamang at walang natira sa mga lumang photos namin na nasira lahat nang baha kaya hindi ako nakasali sa meme mo. Thanks for the nostalgic post. God bless you all always. Oh she is adorable...happy Nostalgia. I am late but hope you can visit mine. palagi na lang late ang post ko .anyway,better late than never.